I have to admit something. 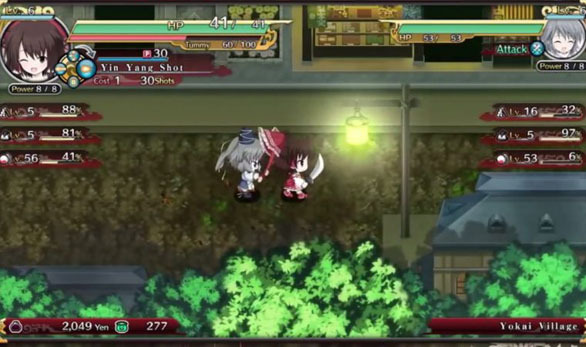 When I first got into this game, and the accompanying Touhou Double Focus, I had no clue what the series really was. Being a happy little social media butterfly, I’d seen the characters scattered across the web and loving crafting in a billion fan art pieces. When I saw a mystery dungeon like title and a side scrolling metroidvania game were on the way in the same pack, I definitely wanted to learn more! From an outside perspective, the quirks of the characters are surprisingly easy to get into. Between both games I was able to get into and enjoy the cast with no prior understanding of the franchise. I think this is the strong suit of the series and something very positive since NIS America has quite the lineup of these titles. It’s easy for Touhou to find a spot in your heart. 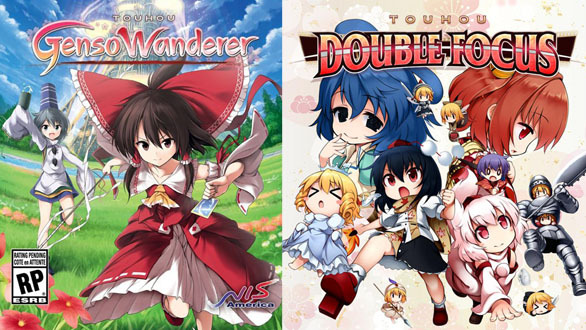 Touhou Genso Wanderer is definitely my favorite game out of the pack, but Double Focus is just a freebie add on anyway it seems. Not to say it isn’t an enjoyable game too. I’m very glad it was included. Though the mystery dungeon rogue-like action of Genso Wanderer kept me playing. First off, I’m one of those people who likes NIS games for the grind. There’s a mix of that here. When you return to the shrine which is your very start point of the game, Reimu reverts back to level one. It’s not quite like The Guided Fate Paradox however. This isn’t just a cosmetic leveling down. Instead, your main focus is avoiding restarting, or instead, leveling up your gear through fighting. There are goodies back at the shrine though too, so leveling down is going to happen. Early on, you’ll come across a Yokai village that works as the main hub for the game and creates an interesting outset for the story as well. 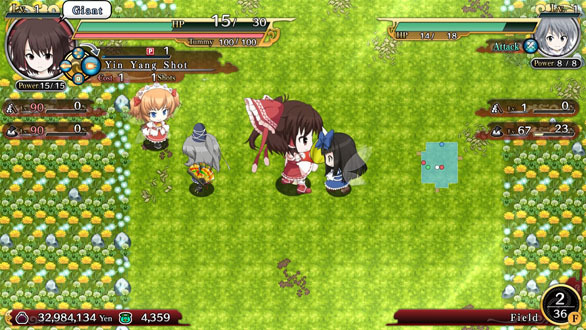 Overall, Reimu is a shrine maiden who should be destroying these spirits. Instead, she’s basically exploiting them to fight her way to a tower where a demon possessed friend has taken up residence. There is some good variety to the dungeon tile sets, tons of items to collect, fill your inventory with, and then sell off, and things to upgrade around town. 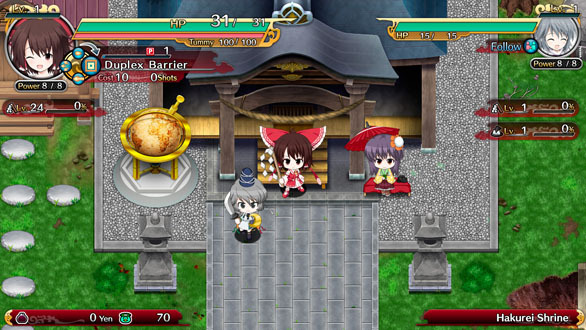 A group of Kappas even run a shop that allows Reimu to teleport around or upgrade her weapons. In general, it’s your usual mystery dungeon adventure, but it’s a fun one. I like the story and I’m glad to see there’s some form of leveling progress. The challenge is certainly here and you are at the mercy of some random hard spots. In general though I’d say most of what I experienced was a decent challenge. Nothing was too insane, but maybe I was just lucky. The village itself is populated by a bunch of characters from the series and your first interaction with the village is going around and getting to know everyone. 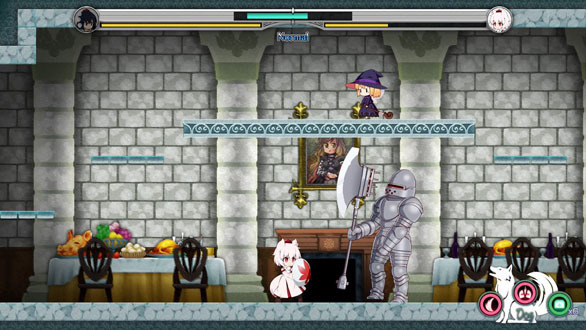 Even the enemies themselves are clones of the characters of Touhou. 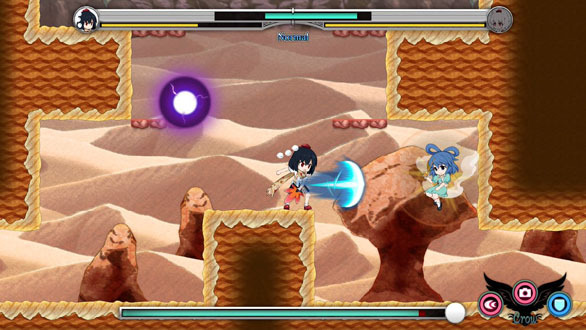 Touhou Double Focus on the other hand is an action game that comes included with Touhou Genso Wanderer. It’s sort of like a metroidvania game that I desperately wanted to have a leveling up system. While the game is fun, if it just had a few more weeks of polish from the original developer it really could have been a classic. Don’t get me wrong, I like Double Focus but it feels very basic at times. Surprisingly enough, boss battles did seem fun and challenging, but the main game seemed to be the awkward frustration. Just wandering around I felt that some enemies had an unfair hit advantage at times and it just lead me to avoiding enemies altogether. I would have rather leveled a bit (which you can’t do) and destroyed them more easily. You do gain a lot of skills however that you can find throughout the game that benefit both Aya and Momiji. Aya for one is able to channel crow abilites that allow her to hover, while Momiji can run up walls and seems to be part dog. These skills do quickly add to your exploration and it does give a really great feel that you’d expect from a game like this. The artwork itself is quite nice, especially with the characters. It’s just the random enemies that seem to beat you down too much and made exploration more difficult than it should be. You can switch between characters on the fly, much like Castlevania: Portrait of Ruin. There’s a good variety of levels, and while the game seems on the shorter side, I got the snot beat out of my characters too fast to really know. Interestingly the health bar seems to deplete from the side that represents that character. So Aya and Momiji share one health bar, but it depletes from left or right depending on who you play as. This can be a trippy effect at first until you realize what’s going on. You can get some health increasing items along the way too, so there is at least that. Apparently there is a way to turn on respawn points, but I didn’t realize that and often went back to save at the start. I was quite disappointed when my first death essentially restarted the game since I didn’t know about saving. My main complaint was that I found the menu to not be obvious enough. Being a reporter, Aya quickly gains a skill to take photos. These are basically snapshops of enemies and friends saved to a gallery. It took me forever and searching online to figure out how to access that. I think it was something incredibly basic, but I just didn’t think about it. Which goes along with what I said earlier that with just a bit more polish, this really could have been a classic title. Some of the action is spot on. Other times it just feels like I had a few cheap deaths along the way. There is a section early on though to replay boss battles. So that’s sweet at least. Together, this is a really nice pack. With the difference between the Canadian and US dollar, it’s a staggering hit when you see it on store shelves however. Don’t get me wrong, I had fun! I just don’t know if the game shouldn’t have been reduced by a bit on PS4 to bolster sales. Yet again though the US price is a lot more fair. $50 for a double pack of titles isn’t bad and if you get into the mechanics of Genso Wanderer, you’ll certainly get your monies worth in time spent.